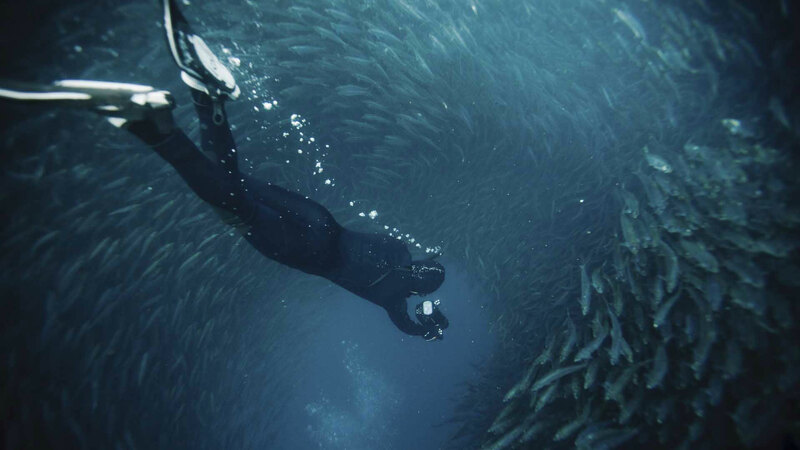 The Sardine Run and all of the excitement that comes along with it is just a few months away. We thought that it is the best time to brush up on sardines. Sardines are in the same family as Herring, namely Clupeidae. These small oily fish are rich in nutrients and consumed the world over and not only by humans but also seabirds, marine mammals and larger fish. Sardines along with other small pelagic fish account for about ¼ of all the marine fish caught throughout the world. Most of us know sardines as an omega-3 fatty acid mostly enjoyed from tins purchased at the local grocer, but these fish can also be purchased fresh and then grilled, pickled or smoked. Sardines are also used for commercial fishing purposes or made into fish meal or oil that is used in animal feeds. Sardine oil is also used in the manufacture of paint, varnish or linoleum. 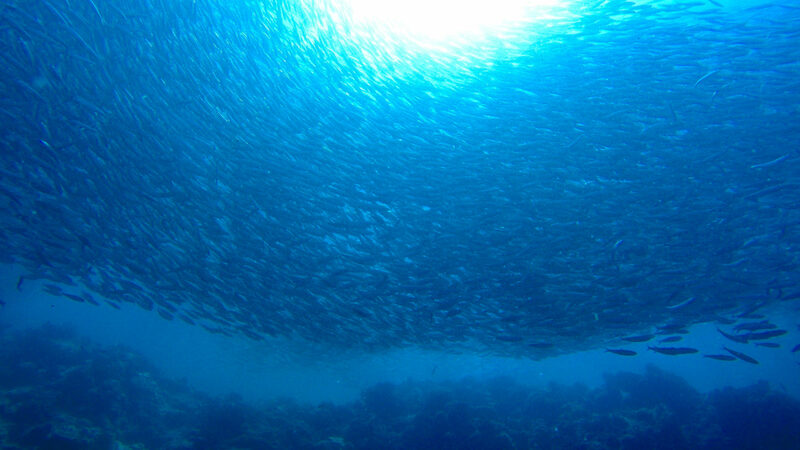 Sardines live mostly in the upper layers of the ocean, to a depth of about 200m. 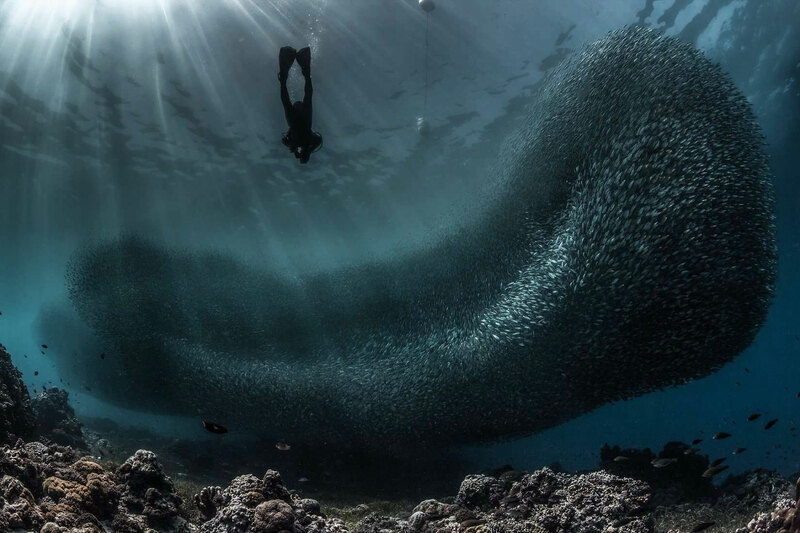 At dusk, sardines move closer to the surface of the water and at dawn, they move into deeper water. This phenomenon is known as Diurnal Vertical Migration. This means that they follow the light. Diurnal migration is used as a defence system from predators. 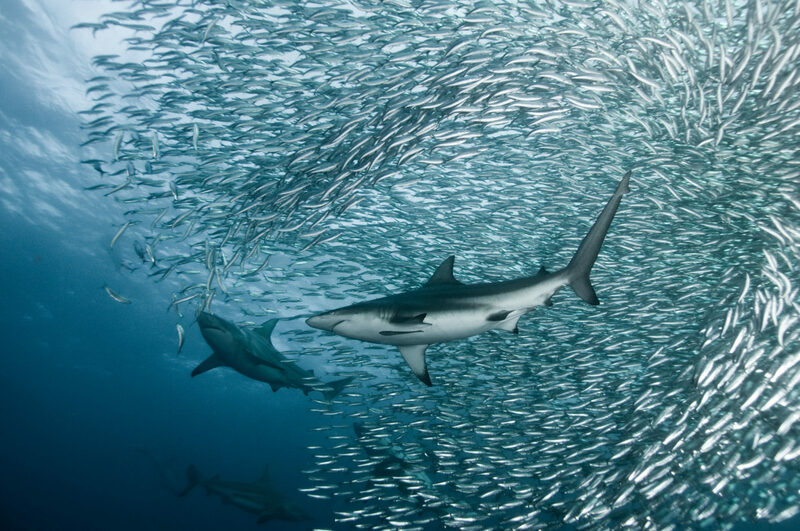 As sardines move to the surface they scatter, and when they descend again they concentrate on forming shoals. Sardines are well camouflaged from predators by their colouring. Their abdomens are lighter than their backs. Swarming together when predators are closing in on them confuses the predator, as predators are then not sure how big their prey is. 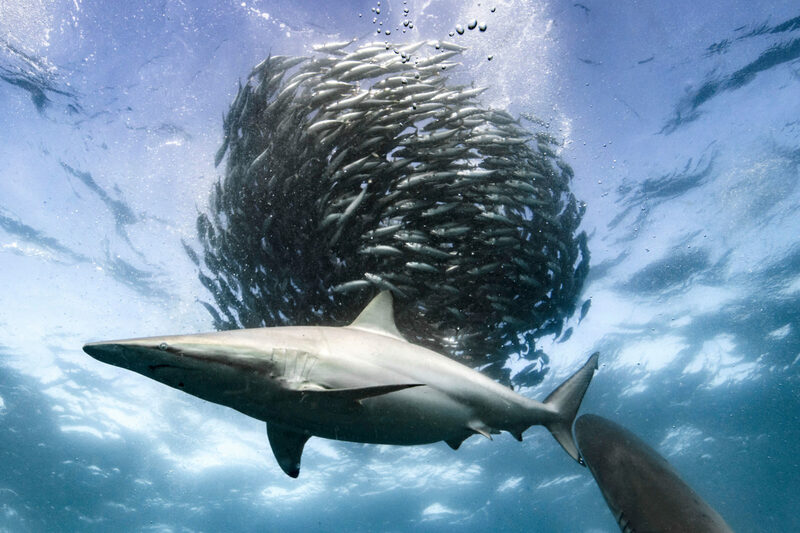 Predators also then struggle to single out one sardine in the group. Safety in numbers really works for these fish! Sardines live off phytoplankton and zooplankton. They play an important role in the marine food chain as they, by been consumed by larger fish, sea birds and marine mammals, then transfer the energy produced by the plankton to their predators. Although Sardines can live up to an age eight years and measure up to 25cm from the tip of head to tail, they do have a very high mortally rate and rarely reach that age or size. Why are Sardines so healthy? Sardines are an excellent source of protein and because they feed on plankton, they contain much less mercury and other heavy metals that are found in larger fish. As the sun becomes a place we avoid, so more and more people are Vitamin D deficient. One can of sardines give you about half of the recommended daily amount of Vitamin D you need. Sardines are a rich source of selenium. Selenium is needed for our bodies to produce glutathione while it is also important for maintaining a healthy thyroid. Sardines are consumed with their skin and bones, thus making sardines a great way to get 1/3 of the calcium we need in one tin in its most absorbable way. Spots for the Sardine Run are filling up and if you want to make sure that you don’t miss this year excitement, be sure to book your place today! South Africa is a land of diversity, and so is the coastline along the southern tip. Home to the marine Big 5, those visiting and diving in South Africa will be in for a treat when coming across any of these ocean inhabitants. From the Garden Route to the City of Cape Town, this region of the Western Cape Province is already well-known as the Whale Route. But it is also a place for visitors to have an opportunity to see the Marine Big Five. 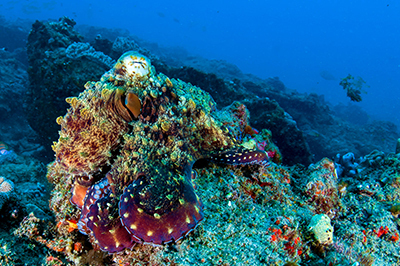 When visiting or diving in South Africa, one of the must do things is to dive in this unique area of South Africa and tick off all these popular sea animals. 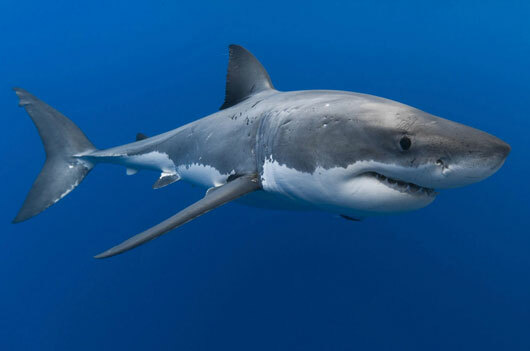 Top of the list of the Marine Big Five is most certainly the Great White Shark. This shark is one of the largest sharks in the ocean, growing to lengths of 4.5 to 6 meters and often weighing up to 2.5 tons. 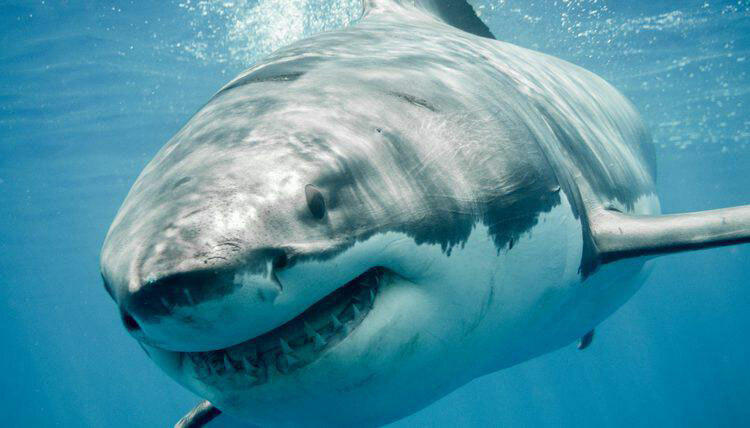 The Great White is equipped with several rows of regenerating serrated teeth. Regardless of its size, this fearsome predator is capable of swimming at a speed of 25km per hour. Shark cage diving in South Africa centres on giving guests the opportunity to get really up close and personal to the one shark that has not only made headlines in the media but which has also become the stuff of horror movies. Despite appearances, the Great White is not nearly the villain it is made out to be. These sharks are well-known to frequent the Cape coast. In the sheltered bays (False Bay or Hermanus) is where the Southern White Whales have their nurseries. A site to behold is seeing these whales frolicking a mere stone’s throw from the shore. Fully grown Southern White Whales grow to a length of 16 meters, a sight to make anyone’s jaw drop! If you are visiting South Africa during the months from June to December, take the time to visit the “Whale Route”, as this is when the whales move into the shallow waters of the bays to calf. When we think of the oceans, we usually think of dolphins, so a trip to the ocean without seeing dolphins is considered incomplete. South Africa’s coastline has a rich marine biodiversity, making the spotting of dolphins more than likely the first of the Big Five that will be ticked off. Bottlenose, Long-Beaked and even the shy Indo-Pacific Humpback Dolphins can all be seen jumping in and out of the surf in both the Indian and Atlantic Oceans of the South African coastline. As cumbersome as they move on the land, so they can move with swift agility in the water. 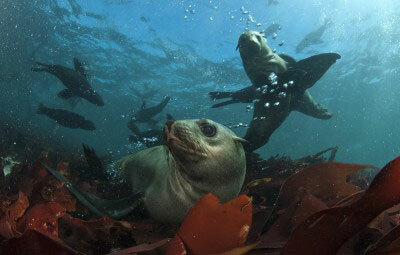 Cape Fur Seals can be found from Namibia and all around the cape and as far up as Port Elizabeth. At the V & A Waterfront in Cape Town, Hout Bay and Kalk Bay these seals are the star attraction. As shy as the seals are on land, so curious they are in the water, so why not go snorkelling in Hout Bay with the Cape Fur Seals. This dapper creature was on the brink of extinction, but now has some well-established colonies dotted around the Western Cape while St. Croix Island in Algoa Bay boasts the largest population in the world. For a guaranteed sighting year around, a visit to the penguin colony at Boulder Beach is a must. A walk on the beach or boardwalk will give you a spectacular view of these unique little creatures in their natural habitat. 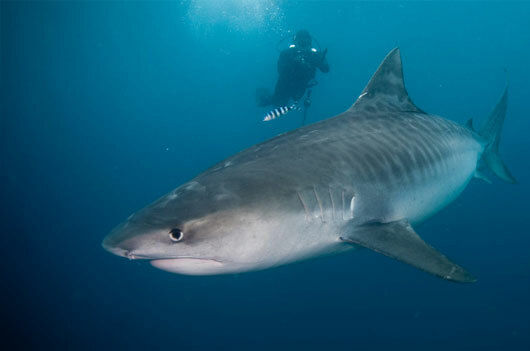 Planning a diving trip to South Africa? Why not book yours with us? We have over 25 years of experience and we can assist you in planning the trip of a lifetime. If you looking for the best diving site off the South African Coast, the coast of Kwa-Zulu Natal is blessed with the warm Agulhas current and a mere 8 km offshore is the diving hotspot, the Protea Banks. This dive site ranks amongst the best in the world with indigo blue water and much pelagic fish. 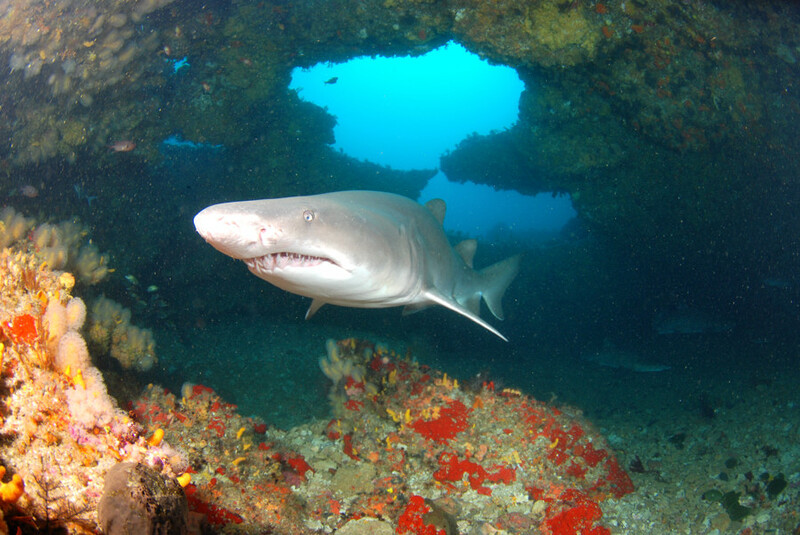 This reef caters for a large variety of sharks, so if its sharks you after, this is the place to be. 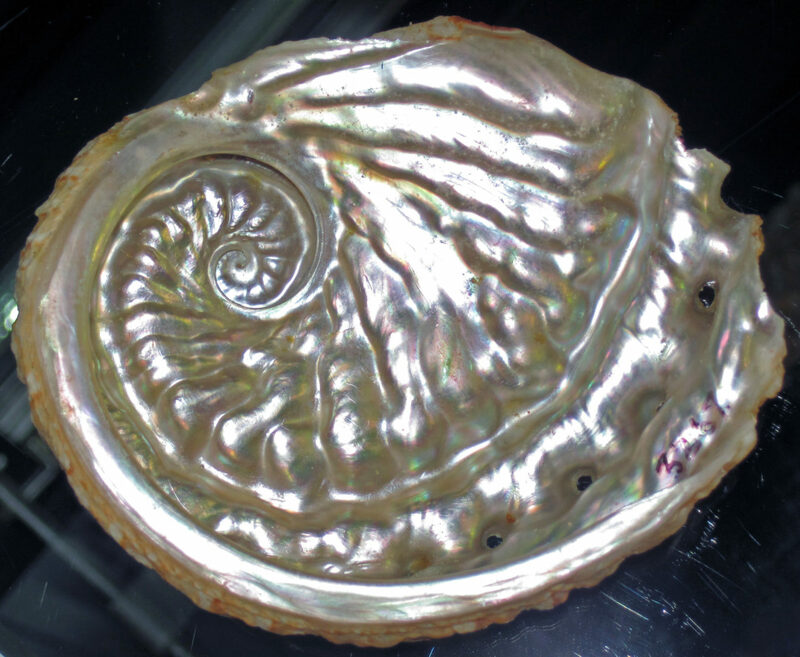 Abalone, otherwise known as Perlemoen, is one of the most sought-after shellfish on the planet. The farming of these creatures is strictly controlled but poachers are slipping through the cracks. Sea Urchins belong to the group known as “Echinoderms” and globally there are about 200 different species found in the oceans. 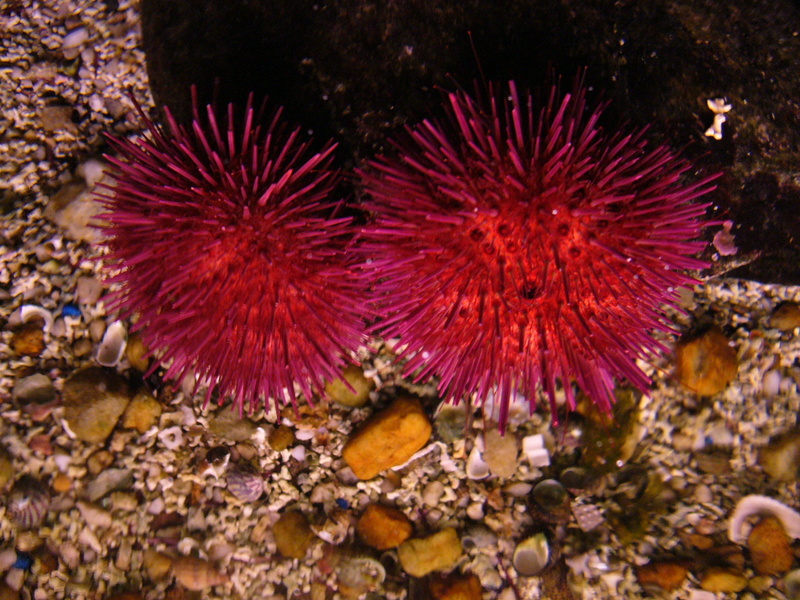 Preferring warm water, Sea Urchins can be found on the rocky bottom of the sea or close to coral reefs. They have a general lifespan of up to 30 years in the wild, however, the Red Sea Urchin has the longest lifespan of all and can live up to 200 years!! South Africa’s maritime history is arguably one of the most interesting. From tales of the Flying Dutchman haunting the coastal waters to numerous shipwrecks settled neatly on the ocean floor, we have a collection of stories to share and interesting places to explore. When planning the perfect diving getaway, sharks might be on your ultimate list…along with all kinds of other underwater critters and creatures. 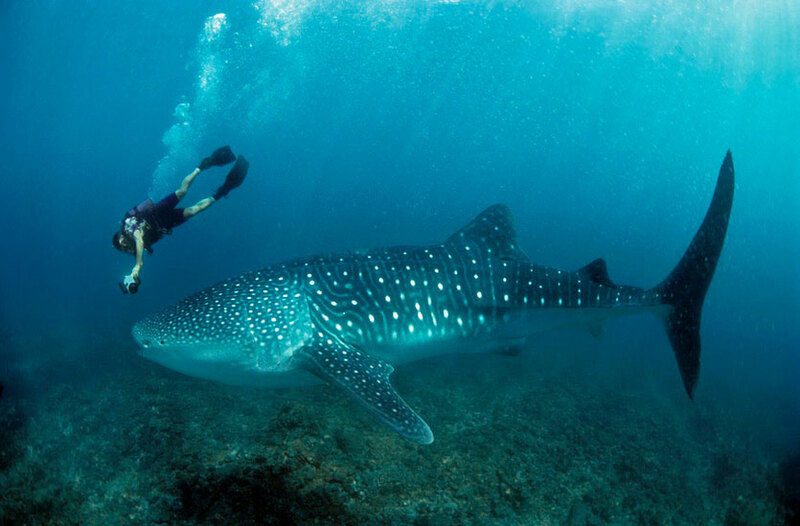 Every year, Dive the Big 5 offers divers the perfect opportunity to see the “fearsome” creatures of the deep. Except, they are not so fearsome once you get to know more about them.